Give your child extra practice with grammar concepts with the bonus exercises within Supplementary Exercises for Workbook VI. This optional workbook is available if your child needs remedial review for a concept that he may struggle with. 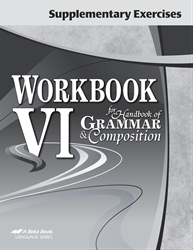 Covering each area that is covered in Workbook VI, this supplemental text gives you the tools to help your child review grammar and mechanics.